Last month, Costco announced that it would no longer be doing business with a California trucking company that had been accused of forcing its drivers to work overtime without pay. The decision is only one example of the actions being taken by many well-known name brands in response to a USA Today Network investigation that revealed the widespread problem of labor abuses being committed in supply lines across the country. Since 2010, approximately 1,150 truck drivers have filed complaints in California about forced overtime and being paid less than minimum wage. Although large retail companies, such as Costco, do not hire trucking companies themselves, but instead hire large shipping firms that hire subcontractors, many have taken the step of dropping companies revealed by the report to underpay drivers. During the investigation, the California Labor Commission ruled that 40 drivers from a single company were underpaid and inaccurately classified as independent contractors. The individuals were awarded a combined $6.8 million for lost wages, although the judges did not rule on whether specific claims of mistreatment actually occurred. A further 27 drivers who alleged violations by another employer were awarded $2.7 million. Unfortunately, hundreds of complaints have yet to be resolved. In July, four Democratic senators sent letters to 16 retailers urging them to look into labor abuses being committed by their shipping companies. Costco, Hewlett-Packard, Goodyear, and Walmart have all responded by either investigating the labor practices of their shipping subcontractors or by canceling contracts with companies that did not adhere to federal regulations or failed to provide assurances of their labor practices. Unfortunately, the commercial trucking industry is not the only place where overtime violations occur, which makes it especially important for those who are not receiving the pay they deserve to speak with an attorney about their rights as soon as possible. 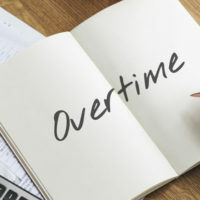 Being underpaid can take an enormous emotional and financial toll on employees and their families, so if you are working overtime and have not been compensated, please do not hesitate to contact one of the Tampa overtime violation attorneys at Saady & Saxe, P.A. Attorneys At Law by calling 813-909-8855 today. A member of our legal team is standing by to help you schedule a one-on-one consultation with an experienced attorney who can evaluate your case.